A Tourist for 6 months! While in Florida, a former student shares her experience with us. Tainá Santos tells us about the decision to improve her fluency in an English-speaking country and shares her travel plans for the next few months. 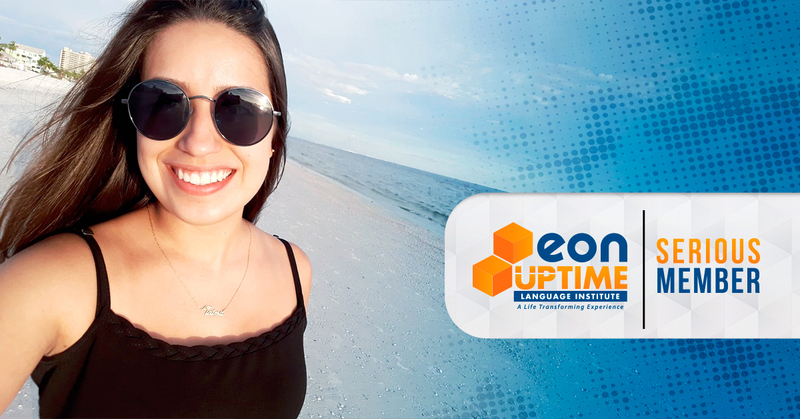 In her first international trip to an English-speaking country, Tainá Santos has put into practice the fluency she acquired at EON UPTIME. As soon as she arrived in the USA, she was surprised with how secure she was when communicating with an American citizen. From Florida, she talks to Blog Up about how her experience with the language has been. “I was looking for a course in which I wouldn’t have to stay for many years”, she explains about her decision after having already studied in a different institute. Two years ago, the business administration student concluded the Connected course in the Itajaí (SC) office. At the time, she was still distant from her dream of traveling to Florida for six months, and her goal was to acquire fluency to “be ready for anything”. The dream of having a new experience abroad motivated Tainá to plan her trip to Florida, the American state where her mother-in-law lives. “I put my business administration course on hold to go on this experience for six months”, she comments about pausing her studies to make her dream of living abroad come true. At the age of 21, she tells us that she has been living incredible moments, speaking a language that she has always wanted to learn – “it’s definitely a dream come true”, she states. With her tourist visa, Tainá plans to visit New York and Boston in the next few months. She intends to get a student visa when she comes back to Brazil, to be able to improve her English in a future specialization in her field of expertise.